(Your choice of Silver or Blue Trim - Choose above. (Your choice of available colors - Choose from above. FINALLY!!! A CHIC-LOOKING COACH�S TOURNAMENT GEAR TOTE BAG... THAT CAN HOLD STANDARD REGULATION CHESS BOARDS, PIECES, CLOCKS, SCOREBOOKS, PENCILS, AND WHATEVER ELSE A CHESS COACH NEEDS TO TRANSPORT TO A TOURNAMENT FOR HIS TEAM! CAJUN CHESS is proud to offer its exclusive "Combo-10" Pre-packaged Coach's Tournament Gear Bag for the special introductory low price of only $150! The light-weight yet strong jumbo travel duffel chess bag is made of 600 Denier nylon and metallic dobby fabric, with dimensions of 21" long x 12" high x 13" deep. 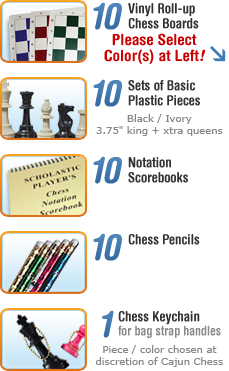 The main body of the bag can be accessed from the top zipper or either side zipper and is long enough to hold standard regulation 20" vinyl roll-up chessboards, sets of chessmen pieces and clocks, while the front zippered compartment, which has a cool-looking knight emblem, can hold notation scorebooks and chess pencils. No need to lug plastic bins which can crack and break to tournaments anymore once you have this fashionable Chess Coach's Tournament Gear Bag! Dimensions are 21" x 12" x 13"
And the best part? it's pre-packed for you with standard regulation tournament gear . . . for only $150!! !